I'm still processing images from my trip, oops. I also realized I have no hard drive space for the images, so I thought about how to remove all of my old images from primary storage and put them into backup. At first I considered Dropbox, but the rate of $100/year for 100 GB is pretty crazy, considering that the images that I'm uploading will probably only be accessed once a year, if that. Instead, I'm using Amazon Glacier, which is relatively new AWS product designed for "secure and durable storage for data archiving and backup" and "optimized for data that is infrequently accessed and for which retrieval times of several hours are suitable." The most compelling aspect of the service to me is that the storage cost is $0.01/GB/Month currently. Additionally, there is no cost to transfer data in, and the cost to transfer data out is $0.12/GB, with the expectation that only 5% of the data will be accessed per month, and $0.13/GB exceeding that (if I am interpreting the sometimes confusingly complicated AWS pricing rules correctly). I'm using FastGlacier, which seems pretty awesome, and is only $40. They have a slightly crippled free version too that can only do two parallel uploads. I'm on a ten day trip to the French Riviera for sightseeing and to see the F1 race in Monaco. I've been documenting the trip with pictures and keeping track of my thoughts on a day by day basis. Typically lousy JFK departure experience. We arrived at Terminal 7, which had our Iberia/British Airways flight. As usual, there was a long line through security. The security check -- taking off your shoes, all metal, separating out electronics - is easily the most stressful and aggravating part of travel for me. It's all just security theater and a waste of eight billion dollars of taxpayer money. We waited around our departure gate for a few hours but got onto our flight on time. The Iberia flight was the best flight that I've ever been on. American carriers are all about the bottom line; everything costs money and they try to upsell at every possible opportunity. Emergency exit seats with more legroom, drinks, upgraded meals, movies, bag checks -- it's all available for a price. The Iberia flight was not like this at all -- we got a great free dinner and then a great breakfast a few hours later. Dinner: hot stew, garden salad with dressing, bread and butter, and a cheesecake. SO good. Breakfast: croissant, muffin, candy, plus a sleek box. They even had lemon slices for the tea. AWESOME. The flight attendants were also great. They were hyperactive Spanish women who didn't speak a word of english. I learned Spanish for three years in high school and couldn't understand a word of what they were saying because they were so fast (admittedly, I was a bad student). They were really nice though. Our flight had a layover at the Madrid-Barajas Airport. Our connecting flight was 6 hours after we had arrived, so I had plenty of time to explore the airport. I liked what I saw. 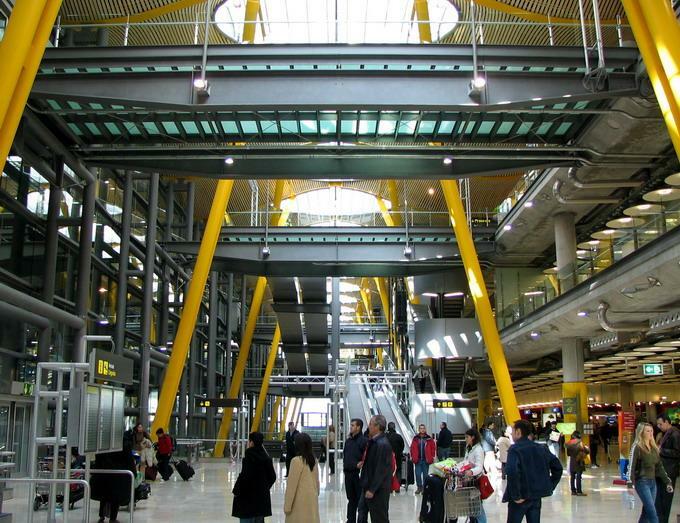 The terminal for our departing flight was of modern construction; it had no ugly low drop ceilings like in JFK. The construction materials were exposed and the environment was built around them, like many other modern designs. At first I thought that the airport was underutilized because it wasn't overcrowded like JFK, but I realized that it was actually correctly sized by design. There were tons of gates and the terminal was organized in a way that traffic flowed without any major clogs. I really liked the design of the main hall within the terminal. The roof is a tensile structure made of wood and metal supported in compression by concrete struts shaped like top heavy Ys. Each strut is painted a slightly different color, so you can see a cool gradient looking down the hallway. The walls of the main hall are all glass and permit lots of natural light, and there are openings at the top of the membrane to allow in more light that is reflected and diffused by metal panels. When it got dark outside, artificial light shined on the panels instead, avoiding nasty direct fluorescent lighting. 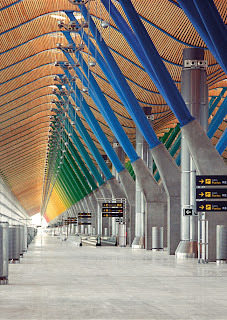 Apparently, this design for a terminal is not new; Denver has a similar tensile membrane structure. After we got off the plane, our AirBnB host met us. She is an attractive young Russian woman who rents apartments in Monaco that directly face the F1 race track. The going rates for such apartments is 2000-4000 euros for 3 days. We are not filthy rich like that, and so, we're staying in Nice and commuting 45 minutes by train to Monaco every day and sitting in the grandstands. Such is life. The French Riviera apparently has a large community of New Russians with too much money to burn. There is even a Russian supermarket a block away from our apartment. The apartment that we have is nice - it's a block away from the beach and close to major attractions. The city is small -- 400,000 people in the city proper -- and you can walk along the major diameter in a few hours, easily. After settling in (it was 8PM local time at this point; and probably about 18 hours from when we had departed JFK), my parents and I went to bed early. I decided to make one last thing in the machine shop before I graduated: a crown. Since I'm no jewelry maker, the crown would have to be made of materials and objects that I am familiar with and know how to manipulate. I wanted it to look imposing, gritty, and have a beauty that reflected the qualities of its individual components. Oh, and I had to be able to source the parts and make it in one day. The design I came up with is simple and I can't really point to any distinct sources. It consists of motorcycle roller chain, bike chain, and 0.5" diameter steel balls. Everything is joined together by welding. old stretched out chain for free from a motorcycle shop I called up. After cleaning it was just a matter of a few hours of TIG welding. At this point I'm half decent at it, so I think things went pretty smoothly. It reminds me of taking a leisurely bike ride on a Sunday afternoon. Getting an arc on polished steel balls is hard though -- there isn't a highly preferred point of arcing on the surface. I wish that I had gotten the tacks to look more consistent, but it looked consistent enough when it all came together. Here's a closeup of the welding work. That big chunk of aluminum is so that I could keep everything in form while I was tacking. I would tilt the whole jig so that the ball I was welding would not go skittering around while it was molten hot (it did happen a few times though...). Here's the final product. I added in the bike chain loops as accents, but they make the thing damn hard to wear because there are now four sharp points of contact with your head. I am going to add a decorative felt lining on the inside, I think. Engineer-hacker-freewheeler. Currently working at Octopart and attending Cooper Union.